Knee replacement or knee arthroplasty is a surgical procedure to replace the weight bearing surfaces of the knee joint to relieve pain and disability. 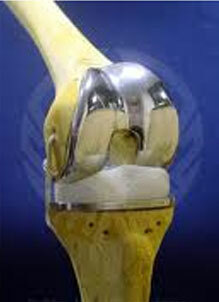 Rheumatoid Arthritis and Osteoarthritis are the usual reasons for knee replacement. It can be performed as a partial or a total knee replacement. The surgery consists of repairing the damaged joint parts of the knee with metal and plastic components that allow continued movement of the knee. Patients under go weeks of physiotherapy and occupational therapy to restore full motion, strength and functioning.